Many of the items that make their way into your home are designed with only one purpose in mind. After you’ve opened up a bottle of champagne, the cage and cork become destined for the landfill. Once you’ve eaten all of the fruit out of the colourful plastic mesh bag, it can’t be recycled and it’s pushed into the trash bin. You can sit around getting blue about all the waste that abounds or you can do what I do and give those items a second chance at life. Why throw it out when you can upcycle it? 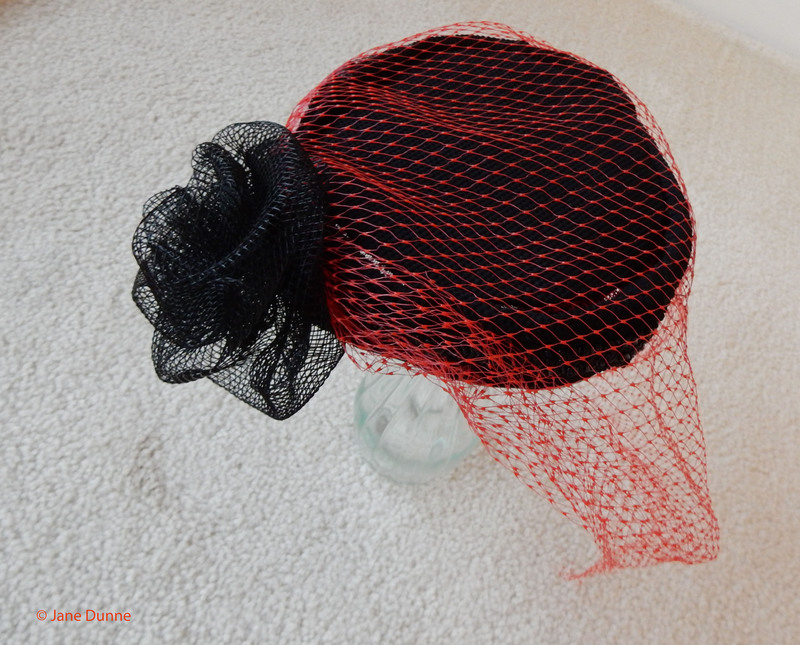 Ever look at a champagne cage and think, “I could turn that into a little Parisian chair” or see a red lattice bag with fruit in it and imagine it being transformed into a veil on a pillbox hat? Well, I have, and I am sure there are many items out there that you could turn into a fun upcycling project. Sometimes these upcycling adventures require a few tools (a pair of plyers, some glue), but mostly they just require a creative mindset and a determination not to put more things into the garbage can. Not sure if you can make anything worth keeping? If you search “upcycling” and “furniture” online, you’ll find projects using wooden clothes hangers that rival Eames lounge chairs for their coolness and design flair. Some of the materials in your recycling bin really deserve to experience reincarnation before their final meltdown because they are just so beautiful that it would be a shame to waste their built-in elegance. I know some of you are thinking that this is all just one person’s unique take on trash, but it’s starting to seem that I am not alone in my upcycling ambitions. Upcycling is no longer just for artisans who are passionate about the environment. Companies are realizing that there are low-cost materials that can be made into attractive consumer items and that making these products from upcycled materials that were saved from ending up in the landfill is actually a big part of their cachet. A small business in Maine is now making doormats out of recycled ropes from the lobster fishing industry. Back in 2009, the U.S. federal government banned the use of floating ropes to reduce the number of North Atlantic right whales getting entangled in them, forcing a switch to rope that sinks in water. This could have resulted in an abundance of the old ropes heading to the landfill. Making the best out of the situation, Cape Porpoise Trading Company partnered with the Maine Lobsterman Association to create eco-friendly goods out of the excess of retired rope. British designer, Anna Bullus, has created the most astonishing upcycling project that I have come across. She devised a way to recycle chewing gum into such items as shoe soles, coffee cups, boots, phone covers and more. Bullus realized while researching the chemistry of chewing gum that it is a versatile and potentially useful material. She now works for Gumdrop Ltd., as they collaborate with manufacturers and companies globally to make a most interesting array of products. Big corporations that are now getting in on the game include Adidas, Nike, The North Face, Patagonia and LUSH. The athletic gear company, Adidas, has recently teamed up with Parley to produce shoes and yoga wear that are partly made from salvaged ocean plastic. These products look really cool, and that may be, in part, due to how Stella McCartney helped with some of the designs. Nike has also made a move into this new niche by having each of the new NBA uniforms for the 2017/2018 season made with the equivalent of 20 recycled plastic bottles. Nike has diverted more than 3 billion plastic bottles from landfills since 2010. The North Face launched a “Bottle Source” line in mid-April. The clothes in this collection are crafted from bottles recovered from U.S. national parks, including Yosemite, the Great Smoky Mountains, and Grand Teton. According to The North Face, 160,000 pounds of plastic was diverted from the waste stream to be transformed into the pieces that make up the collection. Each garment sold will see The North Face donate $1 to the National Parks Foundation to support recycling and reuse programs. Patagonia was one of the early-adopters in regards to upcycling. They have been involved in making recycled polyester from plastic soda bottles ever since 1993. LUSH, a company well-known for its environmental efforts, makes its packaging by upcycling ocean plastic with other recycled materials. Together these materials are combined to make LUSH’s black little pots and bottles. Without question, the most poignant upcycling endeavor active today is by Makers Unite. Makers Unite has come together to craft bright orange tote bags and laptop sleeves from life vests that were used by migrants crossing the sea on their way to Europe. Not only is this an upcycle that carries a lot of meaning behind it, Makers Unite hires new immigrants to help construct the products, providing them with the necessary means to start a new life. But I’m here to tell you, there’s something else… The upcycling afterworld. So revamp those timeworn clothes into carry bags, refashion those old coat hangers into coffee tables and let’s go crazy with upcycling because it’s not only fun, it’s the new way forward. Jane Dunne is a Senior Editor for Specialty Technical Publishers. She works on a diverse catalogue of environmental publications that are recognized across North America as effective tools to ensure regulatory compliance with complex requirements.